If you are wondering what there is to do at Virginia Beach in the winter, check this out. 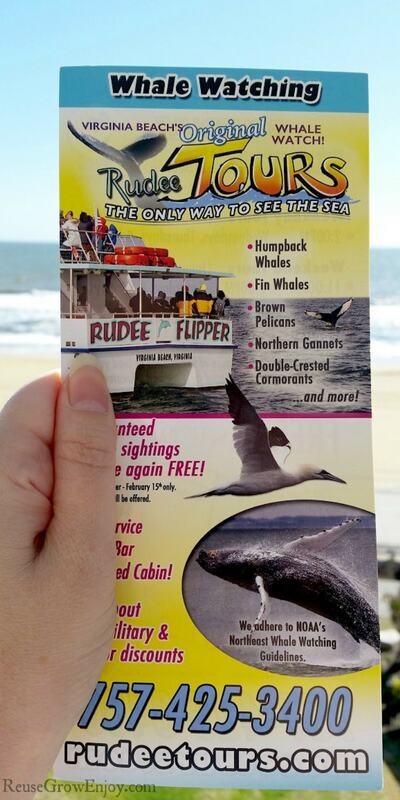 You can check out Virginia Beach whale watching. I think it is something everyone should do at least one time. 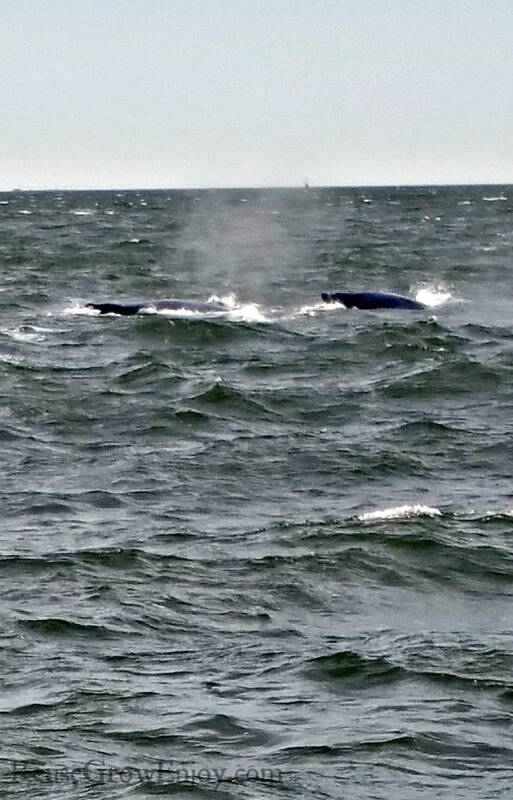 Did you know that there is Virginia Beach whale watching tours? 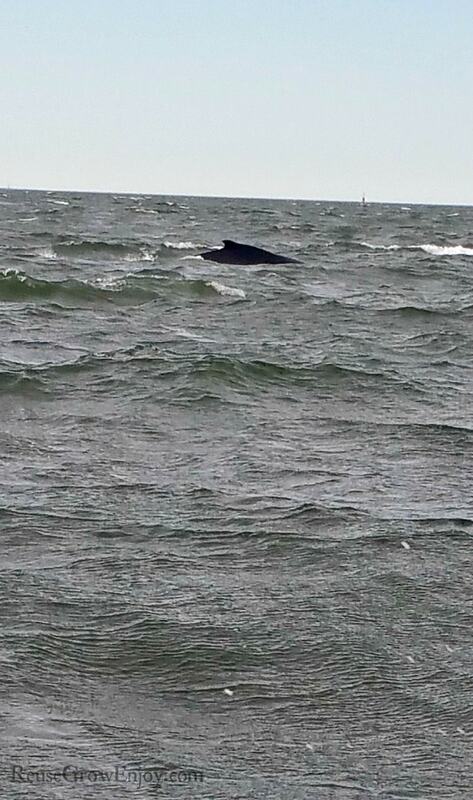 I had no idea that whales are in the Virginia Beach area until about a year ago. Now I am hooked! Never would you think there are fun things to do at the beach in the winter. If you are thinking about planning a trip to Virginia Beach, you may want to consider a winter trip. 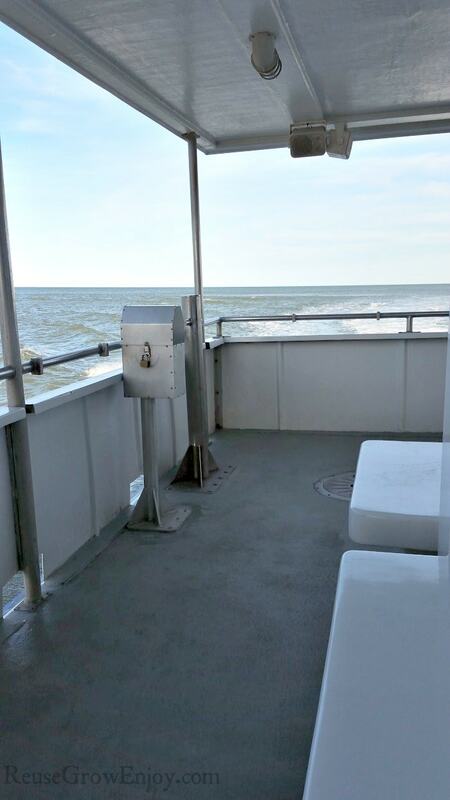 That way you can add Virginia Beach whale watching to your itinerary. While it is not the time of year you would want to play in the water or even lay in the sand, there is still a lot of fun things you can do. I have to say that this was hands down one of the coolest things I have ever done! My husband and I enjoyed getting to see so much wildlife out in nature and not in a tank. Not only do you see whales on the tour, but there are also tons of other wildlife as well. Like dolphins and birds that you normally do not see from shore. We saw a ton of northern gannets. 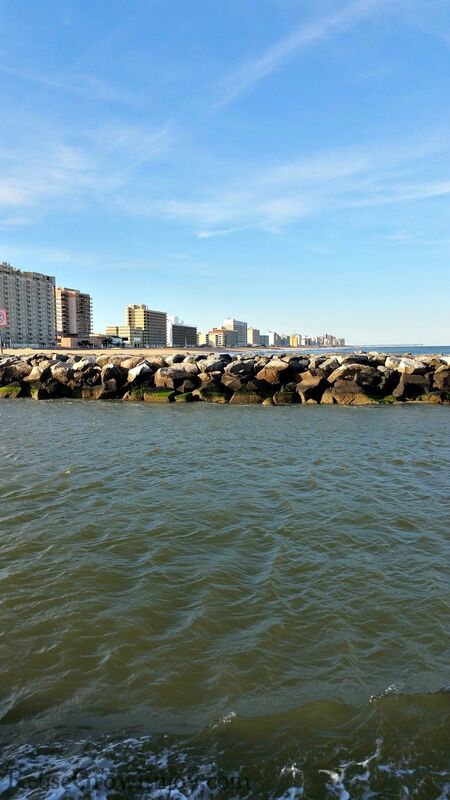 Virginia beach whale watching is not something that is available to do all year long. They only have a few months out of the year that they offer tours. Unlike dolphins, whales are only in the area in the winter. 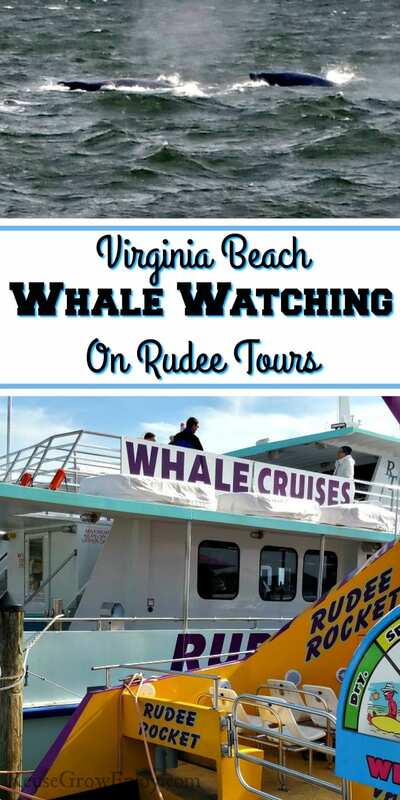 Rudee tours offer whale watching tours typically November – March. They do guarantee whale sightings (they could change their guarantees at any time but this was the policy at the time I went). 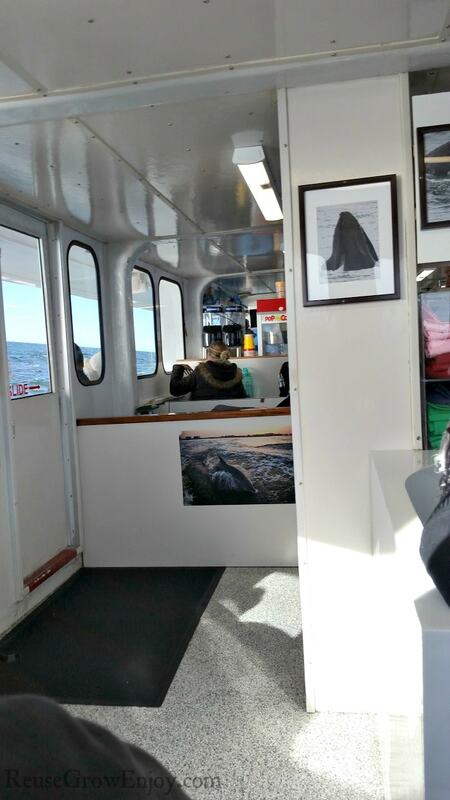 If for some reason there are no whales seen on the trip, they do not offer refunds but do offer for you to go back out again on another trip. 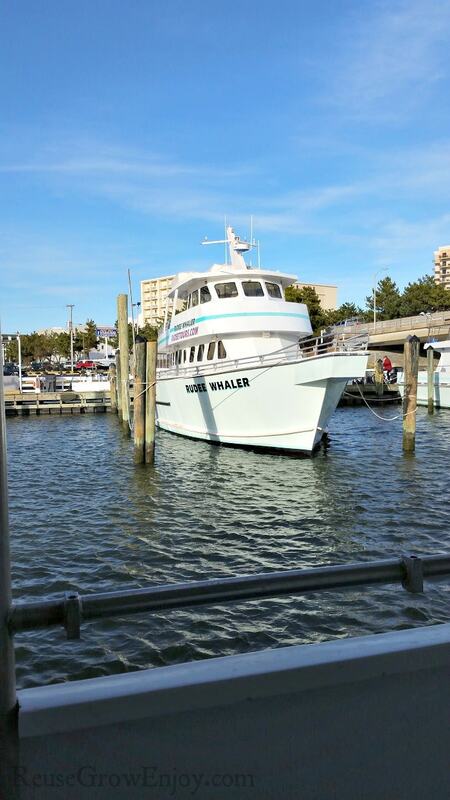 Rudee tours have the largest head boat fleet in Virginia Beach. They also have the only multi-level deck dolphin and whale watching boats. The captain has 30+ years of experience and the trip is also narrated by a trained educator. They are open seven days a week from 8 – 5. However, they only offer whale watching tours on select days of the week during the whale season. 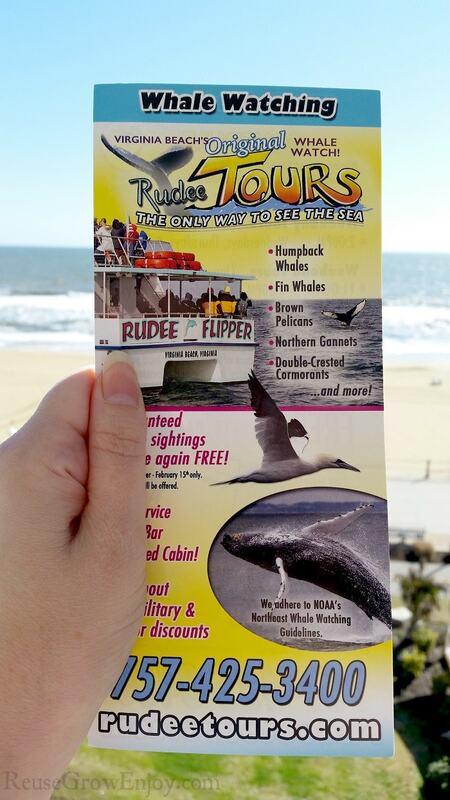 The tour we took was the Rudee Tours Whale Watching Tour. I was pleasantly surprised at how reasonable the prices are. They have two different whale tour boats. But they mostly use the Rudee Flipper as the main one. 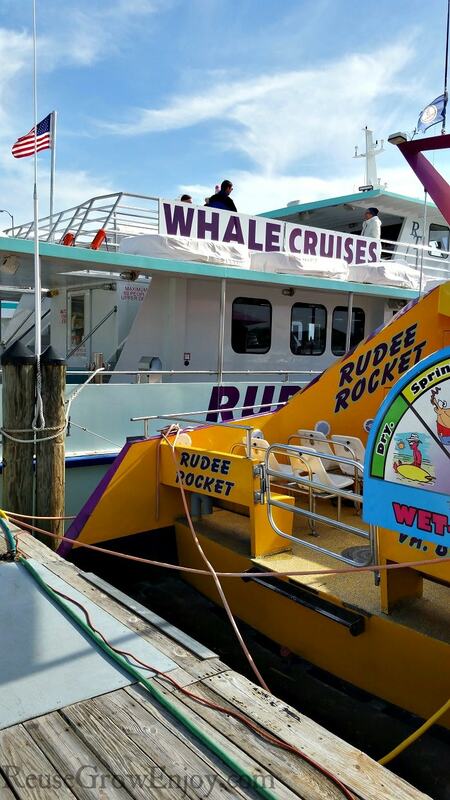 The Rudee Flipper is 65 foot long and 28 foot wide. That is the one we had our tour on. 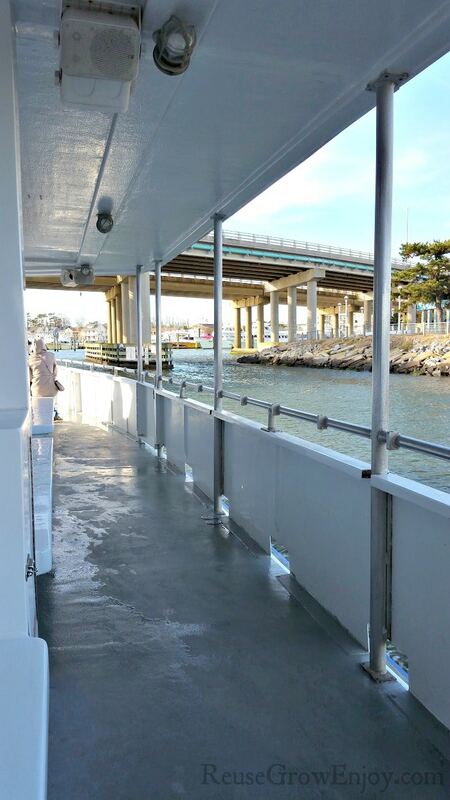 It offers upper and lower deck viewing. The upper deck is just outdoor benches that you can sit on. 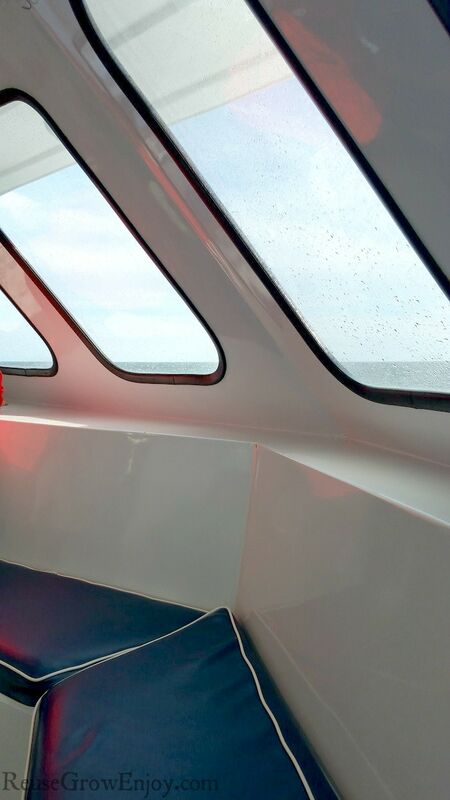 Where the lower deck has the outdoor benches but also offers a climate controlled cabin with windows all the way around so you can see out no matter where you are. Inside that cabin is also where they have two restrooms (not roomy but get the job done) and a snack bar. The snack bar carries a pretty wide variety such as adult drinks, hot dogs, chips, popcorn, candy, soda, sandwiches and more. Also in the cabin is a small gift shop/souvenir area too. They sell things like hats, tees, and hoodies. 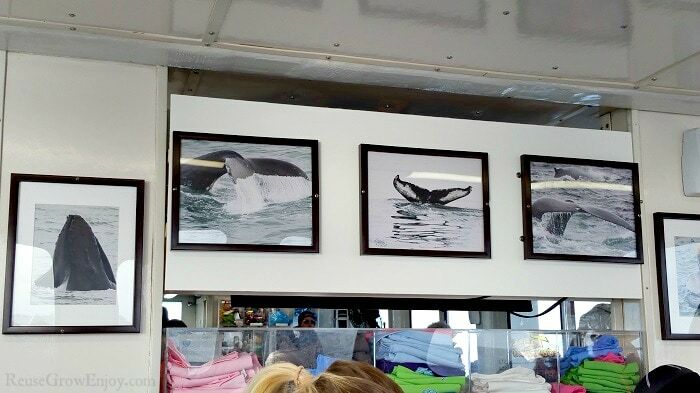 They do also offer to take your picture when you get on board and you can buy a copy in a small paper frame if you want. You will definitely want to take a camera. Just be sure that you keep it dry at all times. I only took my phone that has a camera and I wish I would have brought my big camera as the shots would have been so much better. Will do that for sure next time! Another nice thing I wish I would have brought with me is a set of binoculars. While you can see the wildlife pretty good, they are not always as close as you would like. That is partly because they do not chase after them. They are only allowed to get so close to them and I love that it is a rule that they strictly follow. If they didn’t, we would not get to enjoy wildlife as just that, wildlife. But there are times where the wildlife comes closer to the boat on their own. Another thing to bring is things for motion sickness. This is something I had brought with me and thankfully we did not end up needing it. So pack some Dramamine and some crystalized ginger pieces just in case. Some have had great success with Sea-Bands as well. Or if you know this will be an issue, be sure to take some before you go. While it is not out of the question to have a warm day like in the upper 50’s in Virginia in the winter, chances are it will be cold. So be sure to dress warmly in layers. Plus because you are out on the water, it is known to be a little windier out there. So you should make sure at least one of your layers is windproof. The other thing you need to be ready for is water. I don’t mean rain either. While it could rain (they don’t cancel trips for rain) that is not what got me a little wet. They ocean spray can come over the side of the boat depending on the wind and how the boat turns. Depending on where you stand (front of the boat on the lower deck is the worst area for this) you could get really wet if you are not ready. So either stand in a safer area or make sure you have waterproof clothing on. Or you could always be super safe and stay in the cabin. 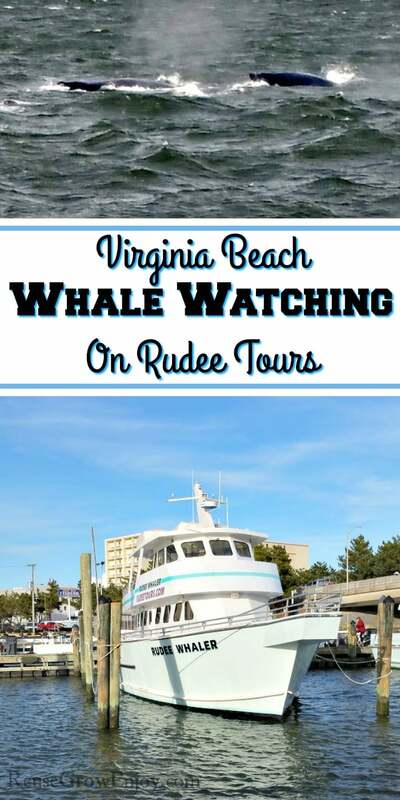 The Virginia Beach whale watching tour is about two hours long give or take a few minutes. That is from the time you leave the dock to the time you return. You do have to show up thirty minutes before your trip. Depending on how rough the water is that day expect the boat to be moving up and down a lot. If for some reason the weather is to bad, they may cancel the trip. So just make sure you double check the day of your trip and see if it is still scheduled. I did find that it was much easier to stay seated a lot because I have bad knees and felt like they may buckle with the waves. When I did move about, I always held on to a rail or wall and it made moving around much easier. Despite all my notes here of cold, wet and rough waters, it really is a blast! I am just letting you know what to expect so you will be ready and have an enjoyable time. 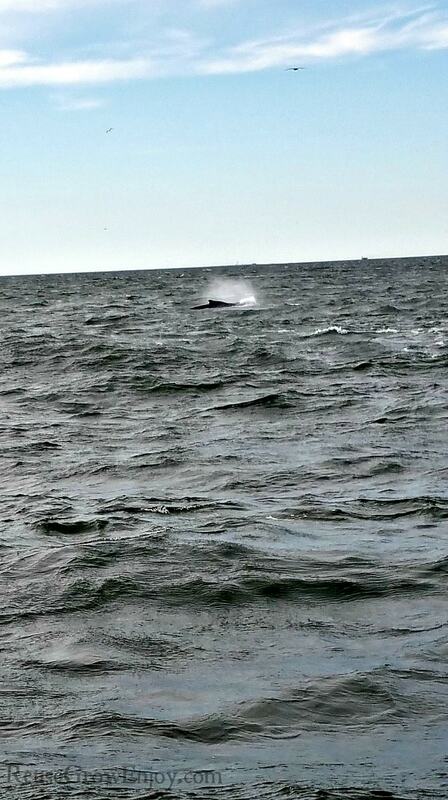 Now that I have been on my first Virginia Beach whale watching tour, I am ready to go again! I am sure I am not the only one that feels this way after a trip. It is so much fun and you really get to enjoy nature and wildlife that is free and out in the open. If you ask me, that is always so much better then seeing them in a cage/tank. Here is a video of some of the whales we saw on our trip. Sorry to say the quilty of the video is not the best as I was working with my phone. Plus we went on a day the water was really rough so it was hard to keep it steady. But I think you will still enjoy it. Looking for more Virginia Beach ideas? 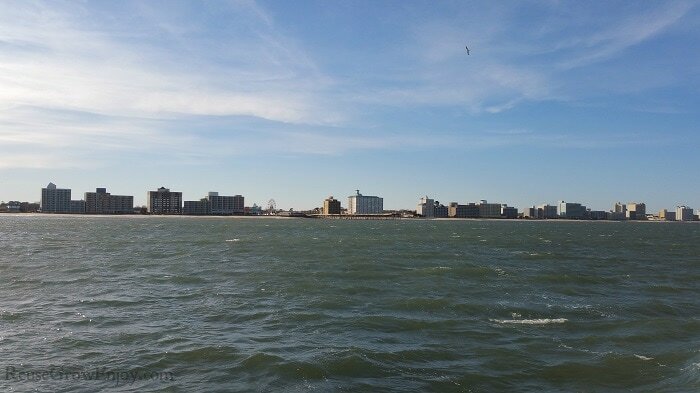 Check out my post on Things To Do At Virginia Beach & Places To Stay!